Last Friday, I had the pleasure of visiting with my sister-in-law Jeannine’s 5th grade class at Horatio B. Hackett Elementary School. The students are learning the concept of word choice and are practicing using descriptive words and phrases to convey specific thoughts. At the beginning of my visit, Jaime Cheafsky, one of Hackett’s student teachers from Temple University (and, coincidentally, our cousin) read aloud from Stone Soup, a fable translated across various cultures in which hungry soldiers progressively persuade villagers to access their personal depository of ingredients and add to a stock pot full of boiling water and stones in order to make them dinner. The class then read aloud from a previously published Clean Plate article as Ms. Beck engaged them with questions regarding vocabulary, context, and the use of metaphors. 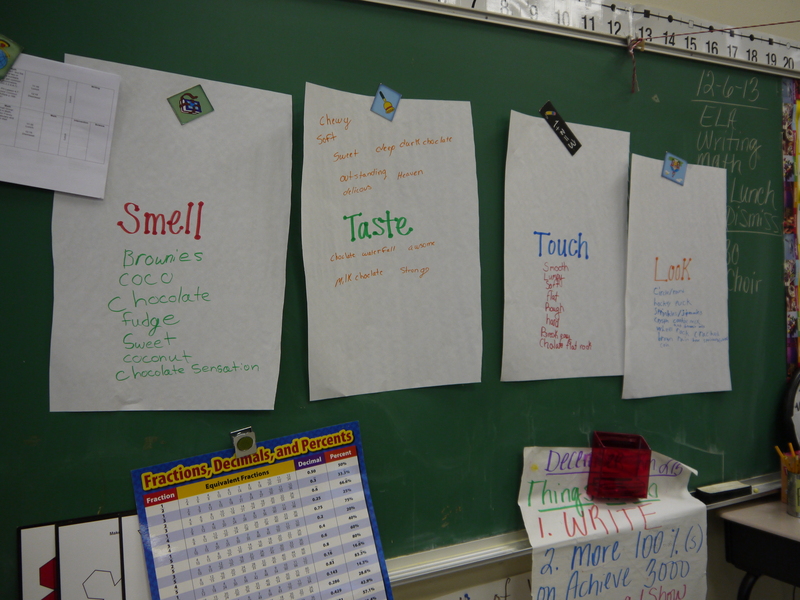 Hackett’s 5th graders developed descriptive words for these brownie cookies. The students’ assignment is to provide their own recipe and incorporate a personal narrative and description, and before they delved into their work I was able to discuss the background of Clean Plate, talk about my writing experiences, and share some tips on how I create my articles each week. The class was incredibly intelligent and interactive, and before I left for the day I figured I would take advantage of the creativity flowing throughout the room and enlist their help for this week’s recipe. I passed around these Brownie Cookies and the students used their senses to help me develop some key words that could paint an accurate picture of what this recipe is like. Whisk dry flour, salt and baking powder in bowl and set aside. Mix butter, sugar, 2 eggs, vanilla and cocoa in mixer. Gradually add flour mixture, and mix until smooth. Wrap in plastic and chill for at least one hour. Preheat oven at 350 degrees. In a small bowl, beat together last egg and water. Set aside. Roll out cookie dough on floured counter. Cut into desired shapes and place on parchment or Silpat lined baking sheet. Lightly brush tops with egg and water mixture, then cover with sprinkles, jimmies, or colored sugar. Bake for 8 to 11 minutes, depending on thickness, until the edges are firm and the centers are slightly soft and puffed. Transfer to a wire rack to cool. Every year, several weeks before the holidays, I break out the recipes from my usual lineup of cookies and decide what will stay and what will go. At the suggestion of my husband, I removed last year’s Chocolate Sables, a biscuit-like French cookie rimmed in sugar, for these soft, brownie cookies. The process is that of a standard sugar cookie recipe, complete with rolling and cutting. 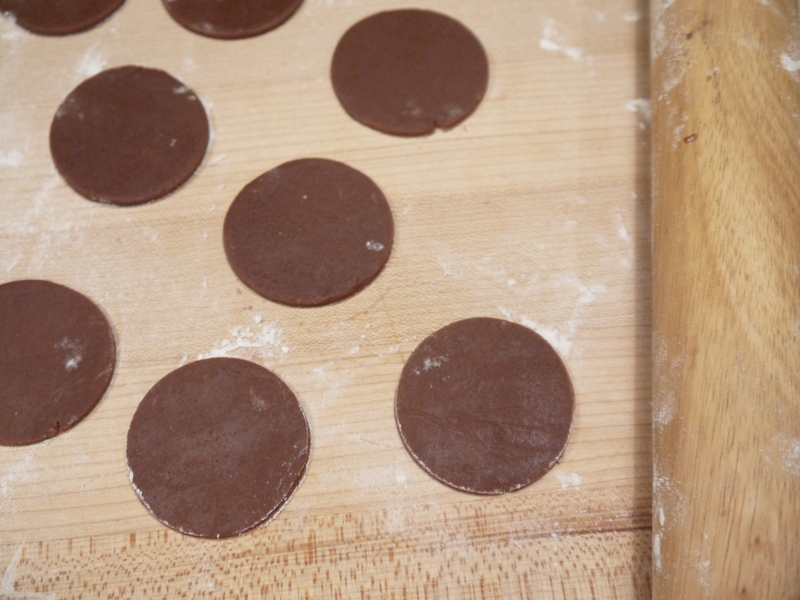 I used a circular cookie cutter, resulting large chocolate coins, but you can use whatever shape you like. The flat, cocoa, brownie-and-cookie mix is topped with colorful sprinkles to welcome the holiday season, and a batch of finished cookies smells like fudge, or even the perfect winter beverage: hot chocolate. The chewy cookies are sweet and rich with flavor, as if each bite were a chocolate waterfall. When I sit down every week to write, I depend on my thesaurus to help me expand my vocabulary and use creative words to develop a mental image for the reader. I didn’t need it this week, since my 5th grade friends at Hackett helped me come up with a descriptive paragraph that sounds so delicious, it has convinced me to make more than one batch of the new addition. They assured me that this one is a hit, and I’m excited to share it with others over the holidays. 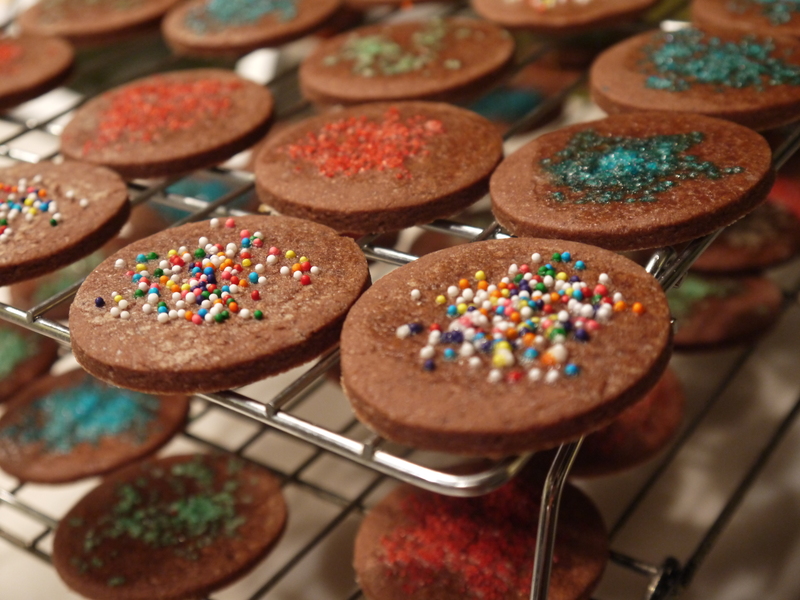 Brownie Cookies adorned with holiday pizzazz.